Unless you've been under a rock the last few days, you know that Pope Francis is in the United States. He stopped first in Washington, DC, then New York, now he's off to Philadelphia. Certainly 3 iconic cities here in the U.S.
Last night, Friday night, I came home wiped and mentally spent after a long (though good) day of Professional Development. I came home with two pizza boxes in hand. 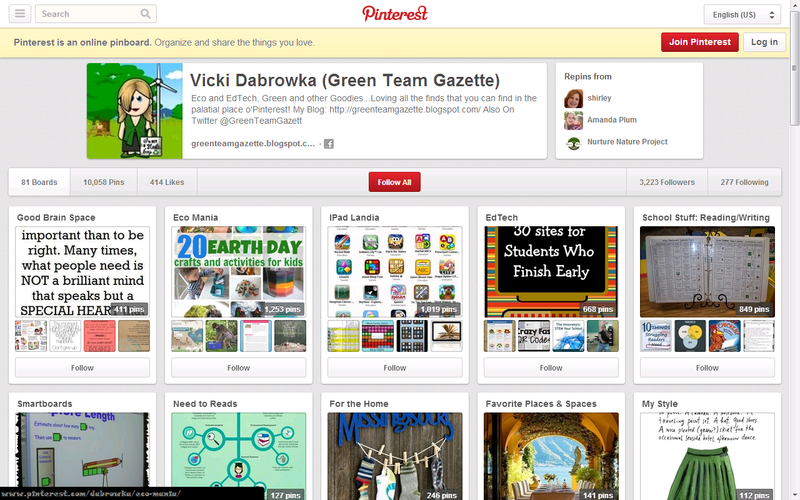 Ah...the life of an elementary teacher here in the first month of school! Plopping in the couch to eat with my family., we were tuned in to CNN. 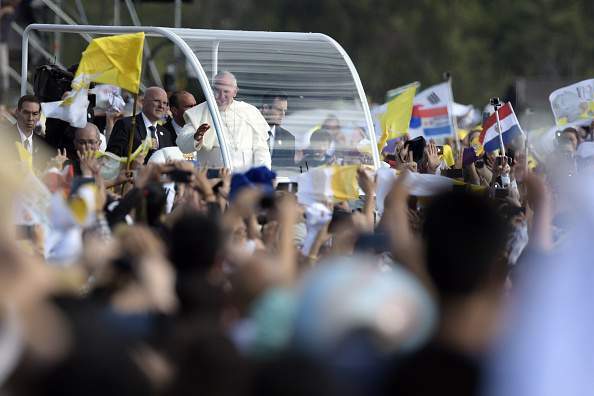 On Friday night, the Pope was touring around Central Park in the "PopeMobile" and then going on to speak at Madison Square Garden, ousting my man, Billy Joel, from his arena. For good and obvious reason. So it is Friday night, and we are riveted by the Pope. There is something slightly awe-inspiring about this on a traditionally happy-hour-kind-of- night. 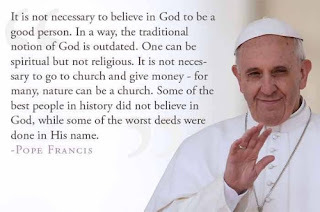 I saw the above picture yesterday on Facebook, and it seems to centralize the humanity of the Pope. I view myself as more spiritual than religious, and time in outdoors can become more heartfelt and inspirational at times than some church sermons. But, I have children and I want them to get some religious education. This is perhaps why that quote spoke to me. Despite the fact that Snopes refutes the above, illustrated quote, there are indeed elements of truisms in the quote that date back to history. How many stories through the ages are there of corruption in the ancient church? How many people do you know who go to Saturday night mass or Sunday morning church to ask for forgiveness for weekly transgressions of true meanness and wrong doing, with the idea that if I confess I am led to absolution? How many hate crimes are on the news due to supposedly doing so in the name of God? Being a church-goer doesn't necessarily make you a good person. You can be spiritual in nature, in your living room, on your back patio, and also in church. I think it's because of the hope we have in this Pope that quotes like the above speak to us. More than hope, it's also about faith, adoration, respect. We respect that he turned down a pricy plated lunch with DC politicians to go share a meal with the homeless. We appreciate his views on humanity and embracing being a good person and being good stewards to our planet. We are touched by his level to pass down the pomp & circumstance and to go a simpler route. And that crosses religious lines: it doesn't matter what your religious bias and leanings are. 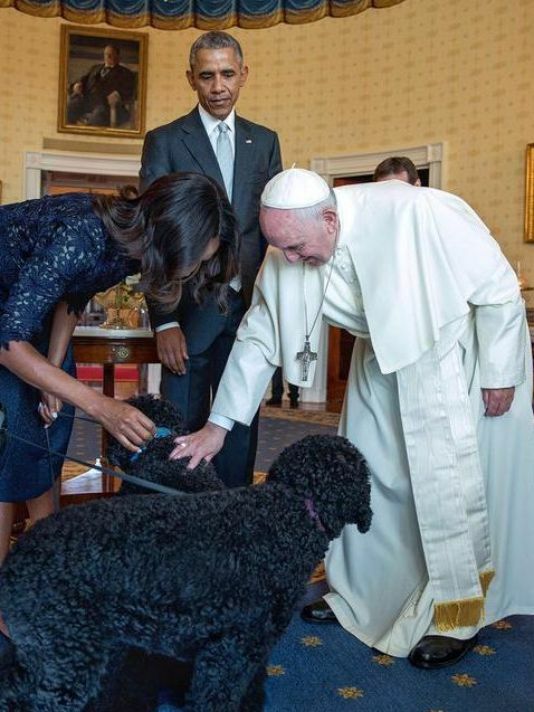 Plus, who can question the goodness, kindness, & compassion of the Pope--clearly a lover of the Presidential Pups? !